Ted Cruz government shutdown: His revisionist attempt to blame Obama and the Democrats. Sen. Ted Cruz, R-Texas, addresses a conservative audience on Oct. 11, 2013, two days after presenting his shutdown strategy poll to other Republican senators. 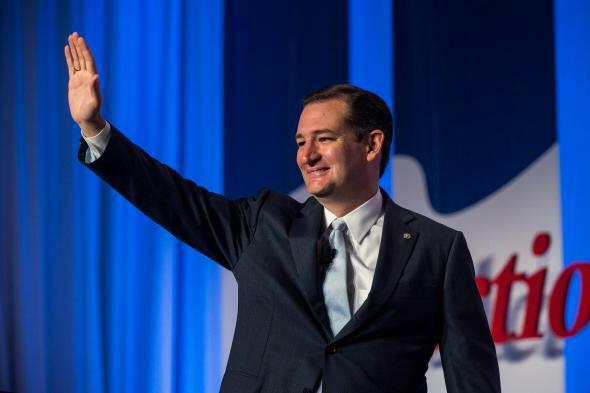 Cruz: I didn’t threaten to shut down the government the last time. I don’t think we should ever shut down the government. I repeatedly voted to fund the federal government. That’s a rational argument. The politicians who saw the shutdown as politically advantageous were the ones who caused it. So says Ted Cruz. Sen. Ted Cruz during a closed-door lunch on Wednesday argued to his Republican colleagues that the campaign he led to defund Obamacare has bolstered the GOP’s political position in dealing with the government shutdown. Republicans who attended the weekly lunch hosted by Senate conservatives confirmed that Cruz presented a poll that the Texan paid for. Cruz’ pollster, Chris Perkins, was there for a portion of the discussion to help walk members through the poll and discuss the party’s messaging strategy. Drucker’s report illustrates the truth about the shutdown: Politicians on both sides—Obama, Reid, and dozens of Tea Party Republicans in the House and Senate, led by Cruz—thought the fiscal standoff over Obamacare would benefit their party. That’s why the standoff happened. When Cruz advises you to blame the politicians who thought they would benefit, that’s generally sound advice. What he neglects to mention is that he was among them. In fact, he was the leader on the Republican side. As Charles Krauthammer patiently explained at the time, Cruz was disastrously wrong about the political fallout. Now Cruz is recasting his ineptitude as innocence. He’s asking you to believe that because the shutdown hurt Republicans politically, he never wanted it. He wants you to follow his logic instead of researching what he actually did. Logic is useful, but it’s not enough. Always check the record.